Sarah is a Research Scientist with The Department of Fisheries and Oceans Canada, whose work aims to reduce the global transfer of aquatic invasive species. Sarah’s research is focused on big cargo ships, which can move aquatic plants and animals to ports and harbours around the world in their ballast water or on the underwater surfaces of the ship hull. 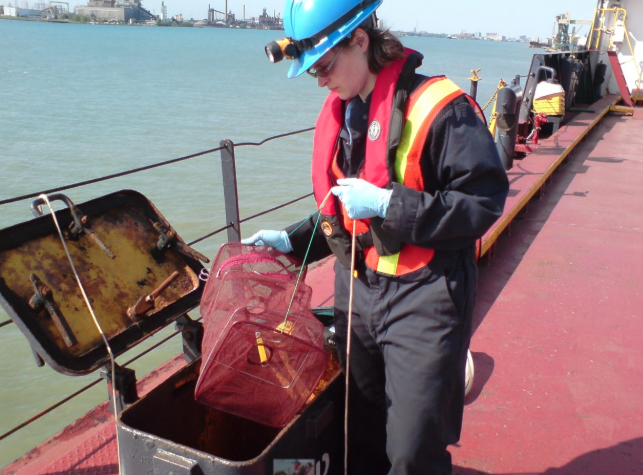 Sarah collects samples of ballast water and biofouling to measure how many live plants and animals are being moved by ships and to test different treatment methods. Sarah has travelled across Canada to complete her research, sailing up the North American Great Lakes, and from Africa to Europe, and to the Canadian Arctic. Her findings are used to make rules that reduce the environmental impact of international shipping activities.